What's the most comforting bowl of soup you've ever had? Many years ago my employer sent me on a long, all-expense-paid, trip to an exotic foreign locale just before a major holiday. My friend drove me down to the airport, we said our goodbyes, I put my gun in the armory and settled down in anticipation of an early call for the next day's flight. I woke to an ice storm instead. After a day or so of 'will the weekly flight go late or just be cancelled' my friend came back, picked me and my gear up, and brought me back home. Where I wasn't supposed to be. I'd already celebrated the holiday, emptied my fridge, given away my houseplants and sent my dog ahead to my spouse. It was a weird few days, of being there when I wasn't supposed to have been there, my brain straddling what was happening with what should have been happening. My friends invited me to many meals during that time, and it was during one post-holiday gathering that I had the most comforting bowl of chicken soup. It was chicken and rice, and I know my friend's mom added some food coloring to make it more visually appealing, but no matter. A mom made me chicken soup when I needed some nurturing and it was good. A few days later I left on my deployment without any weather-related or other drama, but the memory of what a good bowl of chicken soup can do for you stayed with me. As you can see from the title, this is not your run-of-the-mill chicken noodle soup. It's got a Thai twist because I had opened jars of Thai ingredients in the fridge, and the wonderful food bloggers I turned to for advice suggested I use them up in soup. 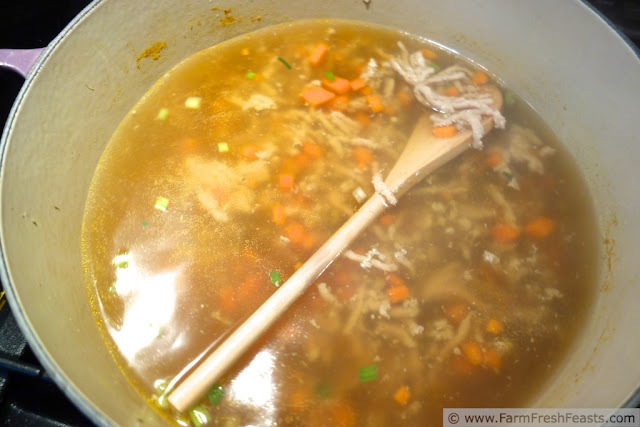 My recipe is an adaptation of both Kalyn's Thai Chicken Soup recipe and Winnie's Thai-inspired Chicken Noodle soup. I used what was on hand in my pantry, and I like my substitutions enough to write up the recipe on its own. 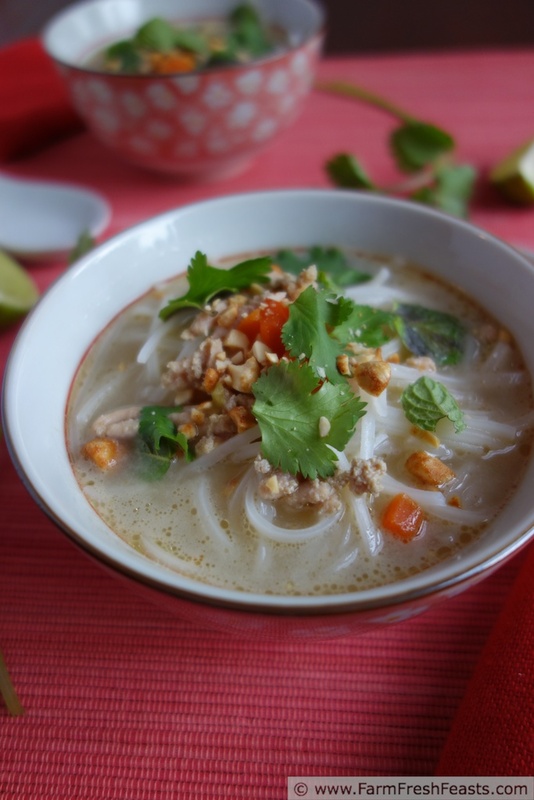 We ate this soup as chicken noodle soup for dinner, using a large handful of rice noodles. The next day, since soup is better the next day, I brought this plus my rice cooker to serve chicken and rice soup for lunch at work. If you need a little nurturing, and can access Thai ingredients (see NOTE below), keep this soup in mind. Use coconut milk, not cream, if you like, or chicken breasts, not ground chicken, add sliced Bok Choy if you've got it in your CSA farm share--but do add the peanuts, fresh herbs, and a squeeze of fresh lime juice for garnish. It's very tasty. NOTE: My Thai ingredients came in jars from Harris Teeter, which seems to trump even the Asian grocery stores I've searched here for finding these particular ingredients. If your mom can't go to Harris Teeter, get them, and bring them to you, I recommend checking the freezer sections of natural food stores as well as Asian markets near you. Once you source them, you won't use much and they keep well, so keep your eyes peeled--especially if you or a friend or relative goes on a trip near a Teeter. I don't recommend simmering the spoon in the stock for very long. I was just trying to get the 'stuff' to stay on the top so you could see it, and the spoon fell in when I grabbed the camera. Place the ingredients for the soup base in a pretty purple pot or whatever heavy-bottomed stock pot you prefer. Bring to a simmer, over medium heat, and simmer 30 minutes. Drain out the solids and return the flavored stock to the pot. Add the chicken through sriracha, and simmer another 15-20 minutes, stirring to break up chicken initially, until the chicken and carrots are cooked through. Stir in the coconut cream and heat through. Serve with noodles or rice, and garnish with any (I like all) of the garnishes suggested, followed by a squeeze from a lime wedge. If you're a vegetarian, how would you adapt for the chicken in this recipe? Here's how Meghan made her Thai Inspired Vegetable Soup! This post is shared with the Clever Chicks Blog Hop, Tasty Tuesdays, Wednesday Fresh Foods Link Up, What's Cookin' Wednesday, From The Farm Blog Hop, Food on Friday (thrice). I wish it was cool enough to want hot soup for lunch! If I went into the basement, yes, I'll join you with a bowl. It's very tasty and comforting. I love this Thai soup that you created. Thank you! So do I. I need to play around with the rest of the ingredients, though, and try more Thai. It's not hard to make this at home (for me, hardest part was finding the Thai ingredients, but my mom scored me some so I'm golden) and the garnishes really did make it seem like restaurant food to me. That looks so delicious! Thanks so much for sharing! Yum! I have got to give this soup a try! I hope you do--you'll be glad you did, as it's a very flavorful and comforting soup. I'd say it would depend on the time you've got available. If you've got the whole day, then I'd do the first part (simmering chicken stock with Thai spices and jalapeño) on High for 2 hrs. Then I'd strain solids out and return the broth to the slow cooker, add the chicken through sriracha and cook on High for 3-4 hours or Low for 6-8 hours. At the end of the time I'd stir in the coconut cream and let it heat while I was prepping the garnishes and noodles. If I was planning to be away all day and eat this for dinner, I'd do the broth the night before and chill the strained broth. The next day I'd put the broth and chicken through sriracha into the slow cooker, set it to Low, plug it in, double check that it was heating, and head out. Oh, and start the rice cooker if I wanted. When I got home 8-10 hours later I'd stir in the coconut cream then prep the garnishes while the soup heats through, and serve. "A mom made me chicken soup when I needed some nurturing and it was good." Will you come make me chicken soup sans chicken? There's something so basic, comforting and nurturing about chicken soup. Somebody pretty sweet gave me a bunch of Thai seasonings, so I'll be making this soup in the very near future. I suppose most vegetarians would use tofu instead of chicken, but I'm not like most vegetarians and I'm thinking potatoes might be a cool addition. What do you think? Would potatoes work here? Once I pad my arsenal of vegetable stocks (I have 2 kinds of corn in the freezer right now, and the wherewithal for mushroom stock) I would be delighted to make you soup. I think potatoes and other chunks of vegetables would be a cool addition to make a Thai-inspired Creamy Vegetable Chowder, but I'd leave out the noodles in that case because--call me crazy--potatoes and noodles just don't do it for me. Let me know what you make with the Thai stuff! 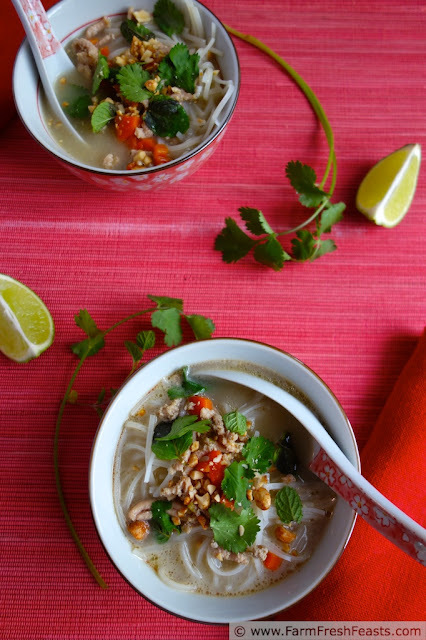 Consider the Thai Inspired Veggie Soup made. Slap me silly and call it fabulous. This soup is damn good! I followed the recipe for the soup base and then veered off course. I used a multitude of veggies: a couple of carrots (sliced matchstick style), bell peppers (also sliced matchstick style), green beans, celery, red onion and half a cabbage. I used a Chinese five pepper in place of the jalapeno and I used Comatose hot sauce instead of sriracha because that's what I had on hand. I skipped the fish sauce and added lemon juice for an acid and a splash of ginger. As you suggested, I used peanuts and cilantro for the garnish, and the result was outstanding. The flavor profile is perfect: sweet and creamy with the coconut milk with a background of heat thanks to the pepper and hot sauce. I think you could probably do this with any combination of veggies too. It's that good. Thanks again!! Excellent--I think that sounds like a delicious version and I'm thrilled for the cabbage being used up. Thanks for letting me know! This looks like the perfect alternative to my Thai takeout favorite! Can't wait to try your recipe! It's a pretty straightforward recipe--and you'd have leftovers which I never seem to do after getting take out Thai food. That's a bonus. WIth soup weather just around the corner I will have to give this a try! It looks so comforting and delicious!! Thanks for linking up with What's Cookin' Wednesday! First it's soup weather, then it's too darn hot, then it's back to soup weather. The fluctuations are good (one last gasp of summer tomato sandwiches!) and bad (we've got leftover soup and it's in the 80s). Thanks, I was pretty please with how these photos turned out. The soup? Delicious. I've had a similar soup during a in the Bangkok airport during a journey from Kathmandu, Nepal to Philadelphia. I had caught some sort of horrible illness in Kathmandu that had made me sick for over a week. During a layover I got a bowl of Thai chicken noodle soup and it was the first thing that tasted good for days! Such delicious, comforting food! What an awesome story! It's wonderful how food memories can really stick with you, and can lift your spirits just to think of them.